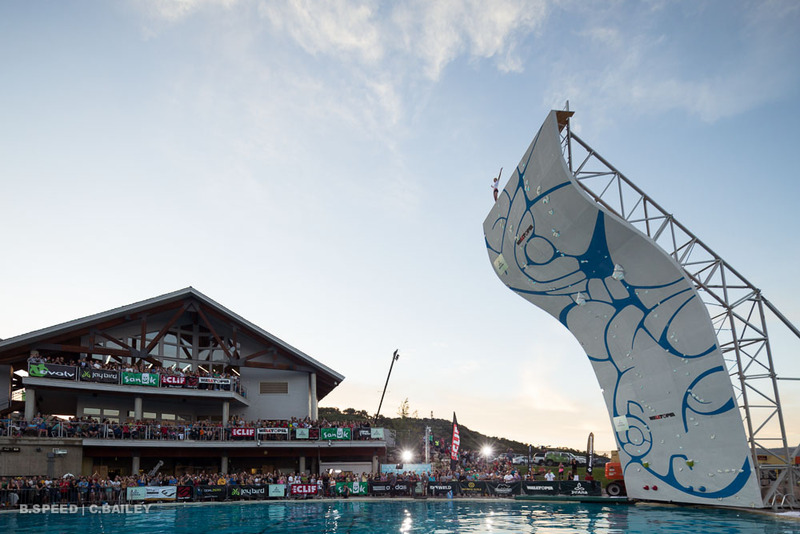 The Psicobloc (Spanish for “crazy bouldering,” or what is commonly referred to as “deep-water soloing”) climbing competition returns to Park City again this coming August 6th through 8th at the Utah Olympic Park, with the competition being held in the freestyle aerial training pool. Last year’s competition drew an estimated crowd of over 5,000 spectators to the event, and over 50,000 viewers watching the live stream and the event re-broadcast. Some of the best climbers in the world competed in the 2013 inaugural competition, where Jimmy Webb won in a dramatic final over Daniel Woods in the men’s field, and Sasha Digiulian narrowly defeating Delaney Miller for the women. This year’s competition will again feature a men’s and women’s division, and will be in the style of a “duel”, where competitors race head-to-head on identical routes, with the highest or first to the top advancing to the next round. 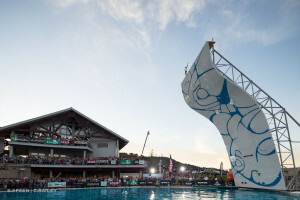 The competition wall reaches over 50 feet above the pool and overhangs roughly 25 feet. The climbers use no ropes or harnesses, creating a thrilling plunge into the water below if they fall.